Georgia has been called the world’s most beautiful country, yet only little is known about it beyond it borders. This topical and vital book by the “ideal Chronicler” Peter Nasmyth is the perfect and much-celebrated introduction to its remarkable people, landscape and culture. About the size of Ireland, Georgia straddles Europe and Asia and is among the most geographically diverse places on Earth, comprising subtropical wetlands, Black Sea beaches, semi-arid plains, the towering Caucasus Mountains and a superb wine-growing region. Georgia’s position on the Black Sea and the legendary Silk Road has made it strategically important to this day. It has been conquered by the Greeks, Ottomans, Mongols, and Persians, became a converted part of the Russian Empire for hundred years, and was incorporated into the Soviet Union in 1921. After its declaration of independence in 1990 a bitter civil was ensued, followed by the Russo-Georgian conflict in 2008. In 25 years, Georgia has undergone a dramatic transformation: Stalin’s birthplace, it was the riches Communist republic, and then became one of the world’s poorest countries before turning into today’s democratic capitalist state. Despite remaining disputes over its regions of Abkhazia and South Ossetia, Georgia’s strong sense of nationhood has reinvigorated the country and made its present as rich and beguiling as its past. 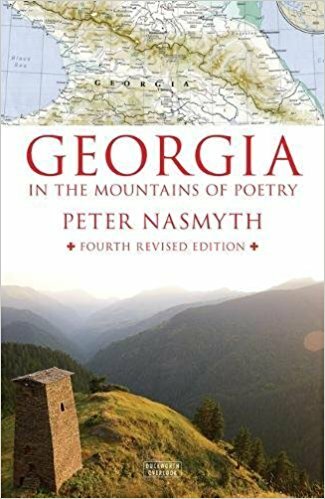 Vivid and comprehensive, Nasmyth’s Georgia in the Mountains of Poetry is a unique eye-witness account of Georgia’s rebirth and creates and unforgettable portrait of its remarkable landscape, history, people and culture. Based on personal experience and offering fascinating insights into the life of ordinary and high-profile Georgians, it is essential reading for anyone who does not yet know, or wants to know more of, this astonishing land.